The Monarch ‘Continental Custard Vanilla’ Slices sat huddled together for comfort beside their evil twin, The Vanilla Cream Slice. The wanton Cream Slice enticed successfully with vampish wickedness. The plain Custard Slice was forlorn, not popular. Although this sweet, good twin stood high and had the perfect amount of icing sugar dusting its crown, biting in was not easy. To use a fork required a stable surface with which to gain some traction. The reward was crisp and tasty pastry and so far the most perfect of all crusts. The custard was thick and held together smoothly. One bite, no vanilla flavour. Two bites, no egg flavour – but perhaps a vaguely perceptible whiff of lemon? Poor plain Jane Custard Slice. So much potential given up for the evil twin of cream. Baby doll, you won’t shine until they get some decent free range eggs into your custard. Now go back and stand in your corner. Monarch Cakes 103 Acland Street, St.Kilda, Victoria, Australia. ~ by Polly Math on May 8, 2009. I’d like to give a $10 discount voucher to your site which your visitors could use in their take-away orders placed on Menulog (700 listed take away restaurants). All they have to do is just type the voucher code (which will be provided upon response to this email) at the check out. This is on top of any existing discounts our restaurants offer to your visitors as part of our normal process. Try Cocoa Patisserie, Kew Junction. Best yet. Hysterical….LOVE your blog…talk about focus!! Gazing upon your empty plate with satisfaction, a perfect vanilla slice should leave you basking in the glory of its wonder. Resting between two buttery pieces of puff pastry the custard should taste of fresh eggs and have a consistency that is not overly viscous nor jelly-like. And if included, the icing should be a firm vanilla that is not too hard. The resulting confection should neither be excessively sweet nor impossible to eat with either the hands or a cake fork. 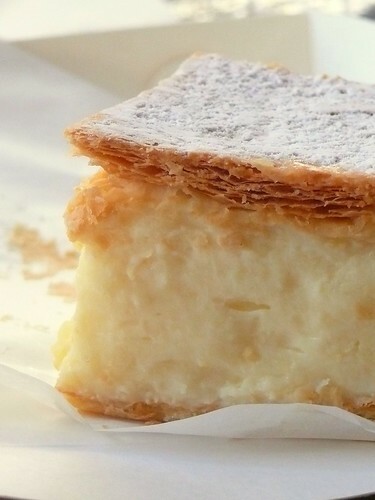 Sampling from Australian Bakeries, this is The Custard Crusaders' quest for perfection and the battle of the bulge.